I bought it from a girlfriend that inherited it from her ex-husband for $500. She was remodeling her house and the construction guys burned the clutch almost completely. I guess they couldn’t handle it. A fishing buddy of mine wanted to adopt it (as long as I kept up the insurance, tag and parts) . He had an automotive shop with a lift. I quickly agreed. We were off to a great start! Once the clutch was in we went on our first camping trip on 4 bald tires. We used fix-a-flat on our first flat tire. He drove 21 miles to a service station for a plug and got two more flats within a mile of our campsite coming back. With my portable tire inflator we plugged the tires with cotton rope and Vaseline to get home. It was time for some good tires. Since the rims were in bad shape I sprung for some plain mag wheels. My buddy’s discount had four brand new white wagon wheel style mags for $125. He also picked up 4 nearly new 33s for another $150. I don’t think we had to lift it but I was told the next size tire would demand it. The next camping trip was much less about the truck and more about the fishing. We vowed to mow the grass in the future to find the red ants before they found us! In South FL most of our state lands are very flat. Hundreds of thousands of acres of swamp hidden by tall grass. We drive about 30 feet above it on the levys. From up there it looks green and plush almost like a golf course a tree or two every 10 or 15 miles. The grass is actually sawgrass 9-15’ high and the blades along the stalks are very sharp on the skin. In the daytime it looks very boring. At night all critters big and small walk and crawl these levys. My buddies and me would drive dusk and dawn picking up snakes. I had tall kitchen cans at the tailgate. One for venomous and one for the harmless ones. On the following Monday I would drive over to the Indian souvenir / alligator wrestling place and sell the snakes to recover money for gas, beer and food on the trip. 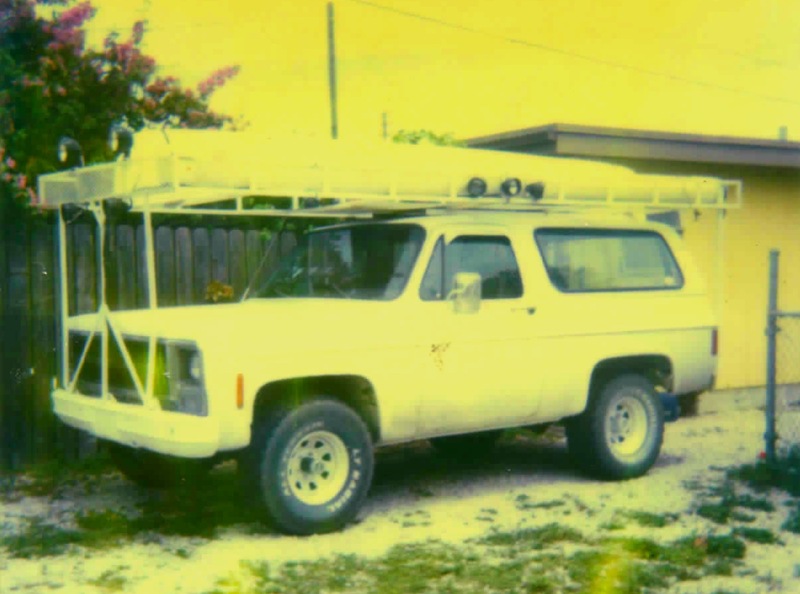 I found a plumbing roof rack with a basket front, rails above the deck and stakes at the rear. This was a direct "bolt-on" with bumper included from a Chevy pick up at a local salvager yard. Next stop – Steel. Plenty of heavy duty screen to keep the fiberglass roof from any serious injuries from firewood, lawn mower and whatever nasty things we did not want inside. We could not figure out how to secure the back of the rack so we ran some large square tubing down to a huge round steel pipe that my friend acquired. They weren’t giving out awards for neatness or the good use of fasteners back then so we just welded everything with no thoughts to protecting the glass or paint from the heat and sparks. Since my friend had a habit of always being late we often did not get out there until after 9PM on a Friday. We had to set up camp before making dinner so it was hurry hurry hurry every other Friday. The OE headlight were just not enough to “read ahead” very well. It wasn’t the thought of hitting something at 70 mph that concerned me. It was the possibility of running over a slippery gator – or even a slippery turtle. The total width of driving area was 12-15' before dropping off. Enter the KC Dayliters! I bought a pair of the brightest lamps available at the time 250000 candle power (I think). First I mounted them just behind the windshield on a cross member. I really could see over 2 miles away. 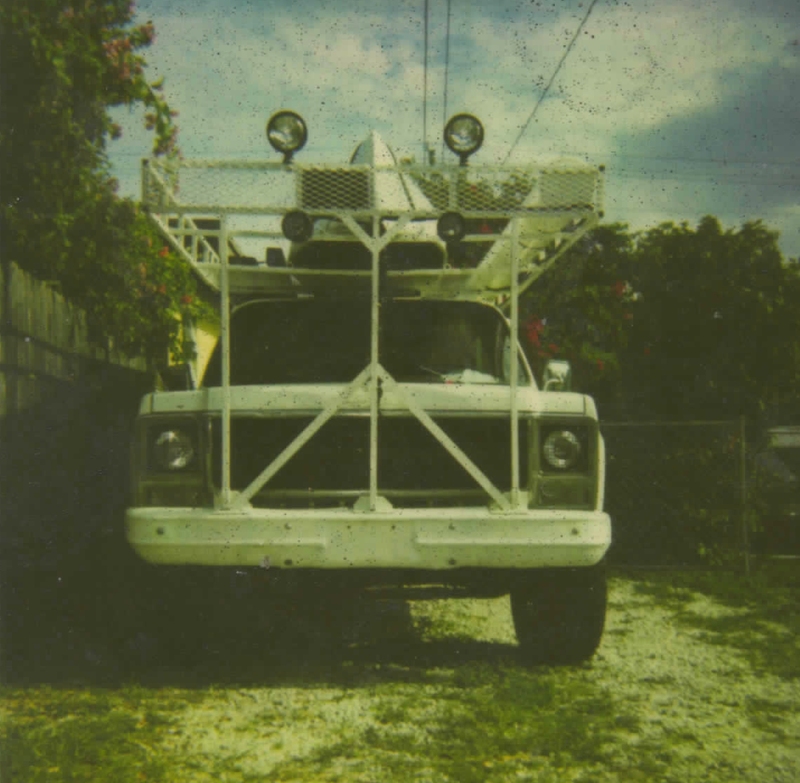 Unfortunately The roof rack and my white hood were illuminated so much that it created a “feedback” effect inside the cab, It was like trying to drive while your passenger is using a handheld spotlight to read a map. I moved the lamps 16” back to put the hood in the shadow of the KCs. The feedback issue was reduced but not fixed. Finally I put them on the very nose of the rack. Incredible light with no feedback. Daytime ahead and only darkness behind! The draw from the switched 12v was too much; so we added a bigger alternator and switched power directly from the battery via a heavy duty Ford Starter solenoid. Last edited by DARK1; 01-23-2017 at 08:04 AM. For those of you that spend a lot of time away from cell towers; emergency communications are as valuable as a first aid kit. In those days cell phones were not as widely used as pagers. We used ours with truckers on the Hi-way to avoid the radar traps. This also gave me an opportunity to use a loud speaker I had lying around. I just plugged it into the P/A outlet. It was like the voice of God, loud and from above. I could embarrass people to get out of my way without any misunderstandings. Even with the Dayliters we sometimes drove right past our campsite at 70 mph lol. It was time to throw additional lighting to specific areas. I picked up 10 outdoor equipment lights made by Toro for riding mowers and such. My buddy had a bunch of 1” square tubing welded into the rails of the roof rack at very strategic angles so that the side to side movement was fixed and the up/down movement was adjustable. In fact, all that steel welded to steel created an opportunity to ground each lamp to it’s own mounting hole. In the end I had nine additional low voltage lights in the rack: two floods on the road just in front of the bumper for safety when handling the snakes, two floods on the right (1:00 & 3:00), two floods on the left (11:00 & 9:00), and three floods at the back (5:00 & 7:00) and one just under the roof rack on the passenger side for backing up and setting up camp. I mounted a fabricated “control panel” for all the switches to these lights and other things. When we needed light, we had as much as we wanted. When we didn’t want light we could drive the levies on a clear night with just a sliver of a moon and millions of stars. 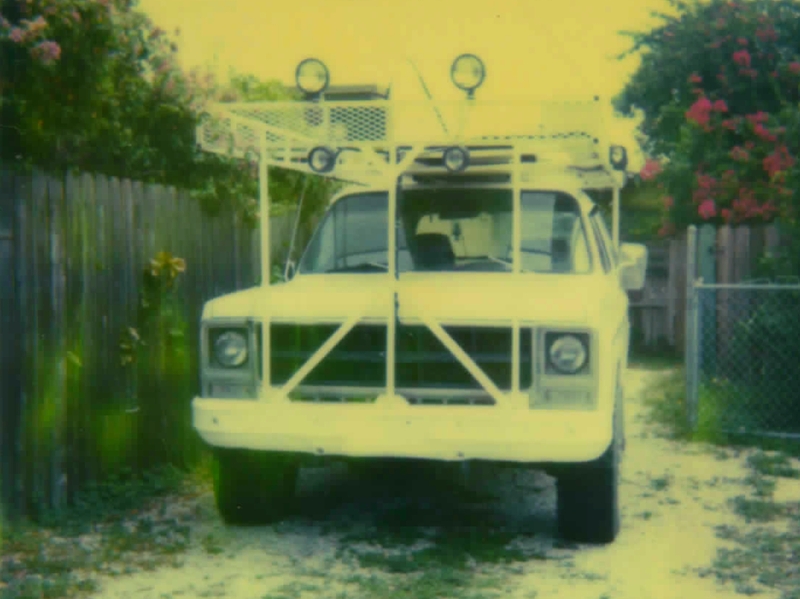 The “Grouper Troopers” (game wardens) used to call our sled the ghost because the Rust-oleum white was only slightly brighter than the sandy roads we drove by moonlight. 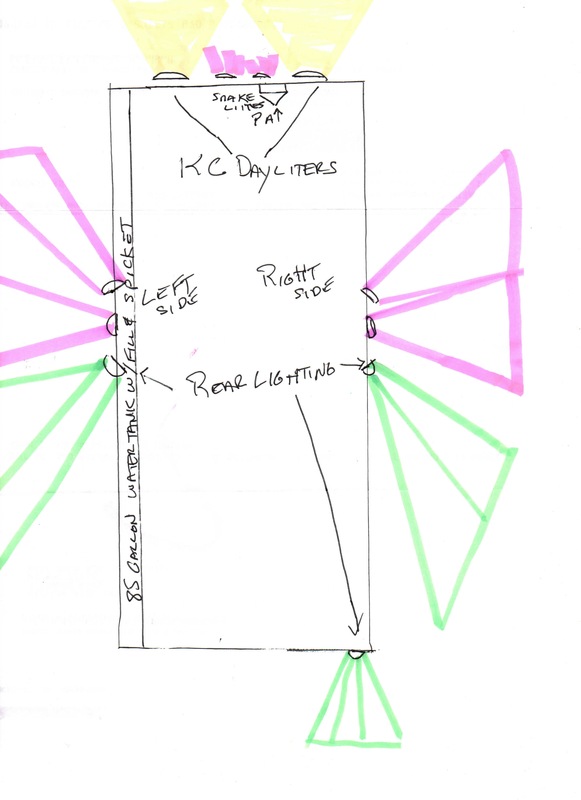 I scribbled out a diagram to depict the lighting arrangement. Last edited by DARK1; 01-22-2017 at 05:55 PM. The fifth mod was our 85+ gallon water supply. The last mods were really about making extended stays more comfortable. We did “pre-season scouting” for evidence of bucks, setting up stands to hunt from and travel routes to get us in the stands quickly and quietly. I put a rubber coated gun rack in the passenger side rear window and a 21’ canoe on top. In a couple of wildlife management areas we were able to utilize the canoe to go deeper and deeper without cutting paths to our stands. This put us away from the other hunters and in one location the other hunters actually drove the deer right to us. Last edited by DARK1; 01-22-2017 at 07:47 PM. Back in an old school Chevy & loving it.